Seyburn Zorthian is a painter and has shown in the United States, France, China, Japan, Korea and Taiwan. An early love of the American and European abstractionists of the forties and fifties and later study of abstract calligraphy in Japan, lead Seyburn to the development of the work she does today. She attended Chouinard and San Francisco Art Institute and received a BFA degree from the California Institute of the Arts. She was a student of shodou master Shiryu Morita in Kyoto, Japan in 1974. Seyburn lives in the mountains above Santa Barbara and maintains a studio at the family-owned Buttonwood Farm in Solvang, California. About the painting:? 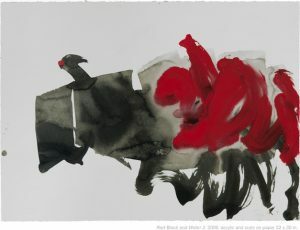 Red Black and Water 2,?2009, ?Sumi and acrylic on paper,?22 by 30 inches. Red Black and Water 2 is one of a series about the Earth elements. It evokes sensual movement, vibrant dance and contrasting emotion. Here, black is a color; the color of the body, the form we take on this earth. The red is feeling; love, joy, anger and sadness. As in the realm of dreams, The Red Black and Water series comes from the abstract language of the Unconscious, and thus communicates to us intangible meaning.